The concept of location based service is really very simple. Imagine you have a map. Pick a point of interest and draw a perimeter around the point. This perimeter is your geo-fence. 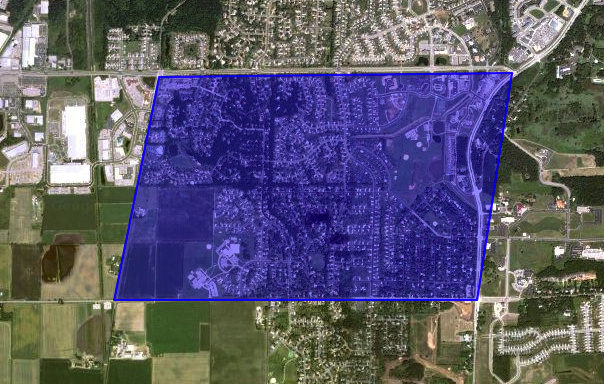 In the map below the blue area represents is the geo-fence. Now imagine services or actions being taken based upon an object or person entering or leaving this perimeter. That is the concept of location based services. The real value of location based services is when real-time or “quasi” real-time services can occur. This has not been a reality for most of us until recently. The miniaturization of GPS receivers has brought us a world where the devices we wear on a daily basis are GPS equipped. GPS units will continue to shrink and we may someday see a “wearable” unit that can be embedded into clothing. Navigation – There are a number of applications that provide navigation. Some turn-by-turn. Others provide information on restaurants/stores in the vicinity. As the technology matures we are seeing more sophisticated navigational services. For example the server uses the latest traffic data to estimate the fastest route. Informational – These services provide a geo-centric search engine. What events are happening in the area? What are the places of interest. Services can allow users to provide ratings for the events / places to provide a list of high quality things to do. Tracking – GPS tracking services usually store the location and allow the data to be viewed using their software. This includes tracking your athletic activities and providing you with distance / timing information. This is already used in many industries to track mobile assets or to provide emergency services. Advertising – As a store owner, what more targeted advertising than those people already near your store. Imagine as you walk by your favorite store, you receive a coupon that expires in the 1 hour. This may be how many location based services pay their bills. Many will provide a service in one of the other categories and sell location based advertising to pay their bills. Social – Many location based services already allow you to network with others based upon your location. Some allow you to allow to accept friends and share your locations. Others create geo-location based games where you compete to become ‘mayor’ of the location. A service that combined geo-location of your car with paying road tolls. No more stopping for tolls. You are billed as you drive. A service that sends text messages alerting others you are leaving a zone (geo-fence). This could be handy for letting the family know that you are on the way home from work. A reminder service could call your cell phone if you not on time leaving for an appointment. A friendly reminder to leave the work zone if the time is after 6 PM. An service could automatically modify the environment (heat, lights…etc) of your house based upon your location. A geo-centric scheduler for people who travel a lot could provide information to ease the pain of traveling. This could be configured to provide driving instructions and alerts based upon your current location. Additional options might be to always provide the nearest Starbucks location. There are already cameras that provide the ability to “geo-tag” a picture. This allows images to not only be sorted based upon time but also upon location. Athletic packages are becoming available that combine heart rate monitoring with location tracking to provide an additional level of detail about your activity. A vehicle that measures gasoline levels/consumption and provides directions to the nearest gas stations (with pricing information) when the level is low. Combining the real time video with location based services to provide an augmented reality. I have already seen some cool examples. This will only get better. There is a concern over privacy and security. However, it doesn’t seem to deter the adoption of many current location based services. Many people either don’t care or don’t realize. I am on the side of “don’t care” as long as I am being provided a service and I can opt out if I no longer am interested. Security will be a big deal. For instance, I would love to track my kids but wouldn’t want anyone else to be able to see that information. With the rapid adoption of GPS enabled mobile devices and the explosion of service based web applications, the next few years should provide some interesting location based services. Good day!This was a really impressive Topics! This site looks awesome! Keep on this great work and pls write more articles like this!